If the Ghostbusters movie from a couple of years ago has taught us anything, it’s that insecure online man-babies will complain about anything that involves putting women front and centre in their precious nostalgic film franchises, even if the film itself is nowhere even close to being worth the effort. 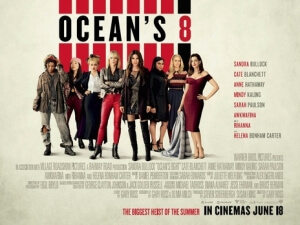 While Ocean’s 8, the all-female spin-off of Steven Soderbergh’s caper trilogy, hasn’t received quite as negative a backlash as Ghostbusters did, the foul stench of online misogyny and whiny YouTube commenters venting about men’s rights or some other BS was still very much circling this project from the get-go. Once again, though, those that are indeed spreading the hate are about to find out that none of it is worth it, because Ocean’s 8 is a perfectly serviceable and mildly enjoyable heist movie that benefits from a great cast, a fun plot, and enough entertainment to make up for its distinct lack of real surprise. We open up with Debbie Ocean (Sandra Bullock), the sister of George Clooney’s Danny Ocean from the previous films – and believe me, I am resisting so hard to make a Gravity joke to explain Clooney’s absence here – and who has just been paroled after a lengthy turn in prison. Almost immediately, she puts plans into motion for a major heist of a highly valuable diamond necklace, due to be worn by celebrity Daphne Kluger (Anne Hathaway) at the upcoming Met Gala. To pull this off, however, she needs to assemble a team of like-minded criminals; soon enough, she manages to bring on board her best friend and club owner Lou (Cate Blanchett), fashion designer Rose (Helena Bonham Carter), jewellery maker Amita (Mindy Kaling), profiteer Tammy (Sarah Paulson), pickpocket Constance (Awkwafina) and hacker Nine Ball (Rihanna). Under Debbie’s leadership, the gang set forth in attempting the heist, but the real question is whether or not they’ll get away with it. If you’ve seen any of the Oceans movies, then you’ll know exactly what kind of movie you’re going to get from this before you watch it. Plot-wise, it’s a similar set-up to those films, and it’s even a familiar execution with director Gary Ross adding nods to Soderbergh’s original vision here and there, and as such there aren’t that many surprises to be found here, or at least none that are significantly unpredictable. That being said, it’s all in the execution, and Ross keeps things steadily entertaining as the heist is being planned out and these women do what they can to gather as much information as they can before they go full steam ahead, and when it comes to the heist itself as well as everything that transpires after, it manages to keep your attention long enough to become curious about its endgame. While nothing in the actual plot is really all that surprising, and for a heist movie there are surprisingly not that many twists to be unravelled by the end, it is held together at the very least by solid enough direction and a fun, if simplistic, plot that anyone can easily follow and have a good enough time with. Holding it even more together is, of course, the great cast they’ve assembled for this film. The Oceans films always thrived on their sheer star power, from Clooney to Brad Pitt to Julia Roberts and beyond, and Ocean’s 8 is no different; when you have fantastic actresses like Sandra Bullock and Cate Blanchett on board, who aside from being multi-talented also have on-screen presence and charisma to spare, you already know you’re in safe hands as they easily carry this movie and have some strong chemistry with each other and their other co-stars. Though some unsurprisingly get the shorter straw of material to work with (Mindy Kaling feels rather underused, as does Awkwafina), they all make the most of their screen time with fun performances, particularly Anne Hathaway who all but steals the movie as the vapid celebrity at the centre of the heist. It’s a lot of fun watching these actresses bounce off of one another, especially as the central heist finally kicks into gear and each of them plays a vital part in the overall scheme, which makes the experience far more enjoyable. Some will undoubtedly pan this movie’s formulaic and unsurprising plot, and it’s certainly a fair criticism of the movie as a whole, but again it’s executed well enough for it to stand perfectly fine on its own. It’s been too long since I’ve seen any of the other Oceans movies for me to make a fair comparison, but from what I remember of at least the first one (I honestly have no recollection of watching the second or third, if indeed I ever did back then) this is a fine companion piece. Whether or not this will continue the franchise in good stead is anyone’s guess, though its US opening weekend numbers suggest it’s the highest debut of the series so it’s completely in the realm of reality to expect an Ocean’s 9 in the near future. Who that ninth person will be is anyone’s guess: Liv Tyler? Octavia Spencer? Amber Davies from Love Island? It’s anyone’s guess at this stage. Joking aside, Ocean’s 8 is a completely serviceable movie with enough of an entertainment factor as well as a great cast to keep it going. Think of it as a light snack of a movie, perfectly digestible with a fine taste to it and fills you up just enough until your next meal, at which point you’ll probably have forgotten even what it tasted like. Ocean’s 8 is a perfectly fine spin-off that may lack much in terms of genuine thrills and surprises, but makes up for that with a solid enough execution by director Gary Ross and a cast of fantastic actresses who are all having fun here.